Rich in Omega-3 fatty acids and strongly recommended by the World Health Organization.Improve your heart health, keep your cholesterol in check, and improve your immune system. Soyabean oil is extracted from the seeds of Soyabean and is a widely consumed cooking oil. Soyabean oil, besides hosting a wide beneficial phytonutrients is also a rich source of Vitamin E that helps build immunity. 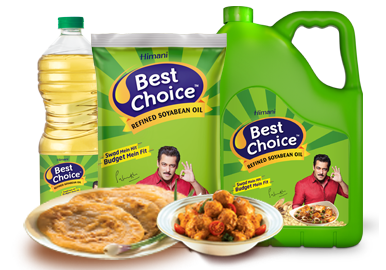 The Refined Soyabean oil by Himani Best Choice is light and odourless. The presence of natural anti-oxidants makes it a healthy alternative to other cooking oils.